2019 Indoor Archer’s Cup Results Final Results! The 2019 Indoor Archer’s Cup is a Star Tournament. The tournament has lines on Friday, 3/22/2019, at 7:00 pm or Saturday, 3/23/2019, at 10:00 am or 1:00 pm or 4:00 pm or Sunday, 3/24/2019, at 10:00 am or 1:00 pm. Awards are presented after the Sunday 1:00 pm line. If you are not present to receive your award, it will be mailed to you. 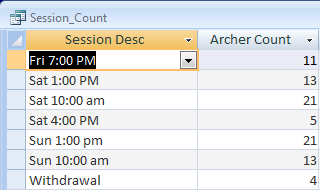 The tournament is an Indoor Round and consists of a 600 round (20 ends of 3 arrows) within a two-minute time limit per end. All competitors will shoot at a 40 cm multi­color face or a triangular 3­-spot face at 18 meters. The inner-10 ring is ing effect for Compound Division. The outer-10 ring will be in effect for all classes in Olympic Recurve, Longbow, Traditional Recurve, and Barebow. Constitution and Rules and USA Archery Dress Code will be strictly observed for all competitors in the Olympic Recurve, and Compound and Barebow divisions. For the Longbow and Traditional Recurve divisions, USA Archery Dress Code and USA Archery Traditional Rules are in effect. For Collegiate Archers the Collegiate Rules and Collegiate Dress Code are in effect. All competitors must be a member of USA Archery. Temporary USA Archery memberships are available for all NFAA members. 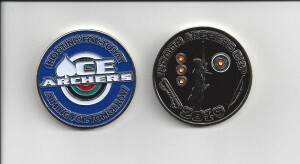 All competitors will receive a Tournament Challenge Coin as part of the application fee. You will receive your Tournament Challenge Coin at the registration desk when you check-in and get your score card. We are on the 3rd floor and there is no elevator. A late fee of $10.00 will be charged for all applications received after 3/15/2019.